The flag carrier from the Sultanate of Oman is growing! FLYBYSCHOOL has designed a special program taylored to meet their requirements. The course will be 15 months, following the same timeline as the Integrated ATPL Program but adding one additional month of training. More about the Integrated ATPL Program. 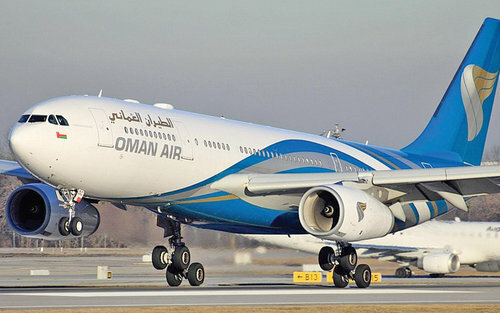 The Oman Program has a one month extention for students to have time to retrieve an extra 20 hours of fly time on an SE-VFR in order to comply with their requirements. Min requirements are to have 200 Total Hours and 100 PIC hours (Pilot In Command). With our training you will not only complete 100 PIC hours but a total of 258 hours including a Multi Crew Cooperation course. With our training you will gain the EASA Commercial Piloto License (CPL) coupled with Instrument Rating (IR) and Multi Emgine (ME). Additionally you will gain your Airline Transport Pilot License Theory (ATPL theory) and Multi Crew Cooperation (MCC). English for non-native speakers equivalent to ICAO 4 or IELTS 5.5. Graduates of FLYBYSCHOOL are issued with the EASA Frozen Air Transport Pilots License (Airplane). The price of the course is €66,250 if you apply before 31 May and start training before Ausgust 2019. After then it will be updated to € 70,750. Our prices are inclusive of VAT, all training, landing fees, accommodations, shuttle between dormitories and airport, iPad, etc. Price does not include meals. FLYBYSCHOOL can now offer a full package like our standard EASA training including meals for €70,000 after 31 May it will be updated to €74,500. Shuttle service between dormitories and airfield for 13 months (no flying during first 2 months). Dormitories are walking distance from University. Official ATPL exams in Leon! (1 try per subject). Basic Health Insurance required for the Spanish ID for foreigners (15 months) from start of training in Leon. Only for non-EU nationals.